Shopping for homeware has quickly become one of my favourite things to do. As you may or may not know, in a few months I will be moving out of my family home and into my own little house with Matt. This has been such a long process for us and it’s been exhausting! But finally, we are at the fun part, buying bits and pieces for our home, something I have been really looking forward to. It’s actually really difficult to shop for a place that you’ve not even technically been in yet (the house is a new build), but I’ve not let this stop me, much to Matt’s dismay! 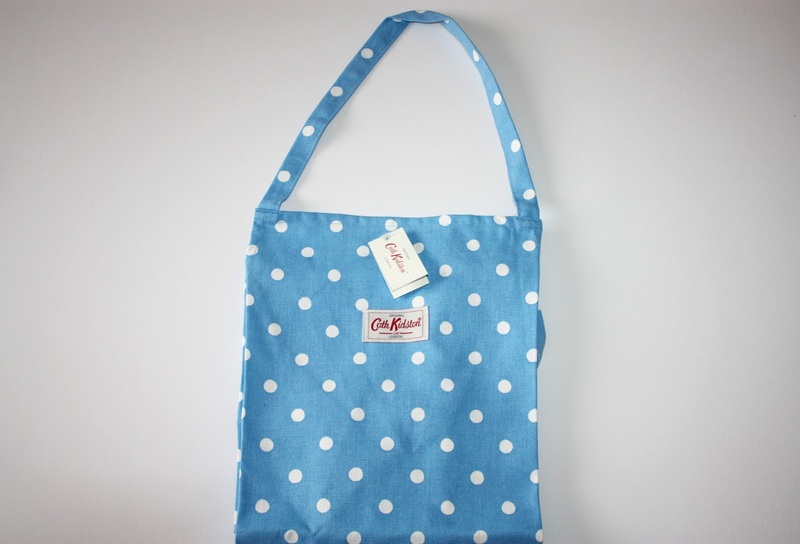 Having picked up some really lovely bits recently, I thought I would let you take a look into my shopping bags! Any one who knows me will tell you how much of a Yankee Candle fan I am. Over the last year I have collected numerous ones to be used for different seasons and different occasions and with such a variety of smells to choose from, my collection will never be complete. I find it useful to keep a list of the ones that I like the smell of so that when I decide to treat myself, I know which to go for. I actually tend to get all of mine from Amazon as it’s cheaper, but stopping by Clinton cards yesterday, I found they were having a 50% off Yankee Candles sale! I dived straight for the Garden Sweet Pea one having been eyeing it up for a while now. 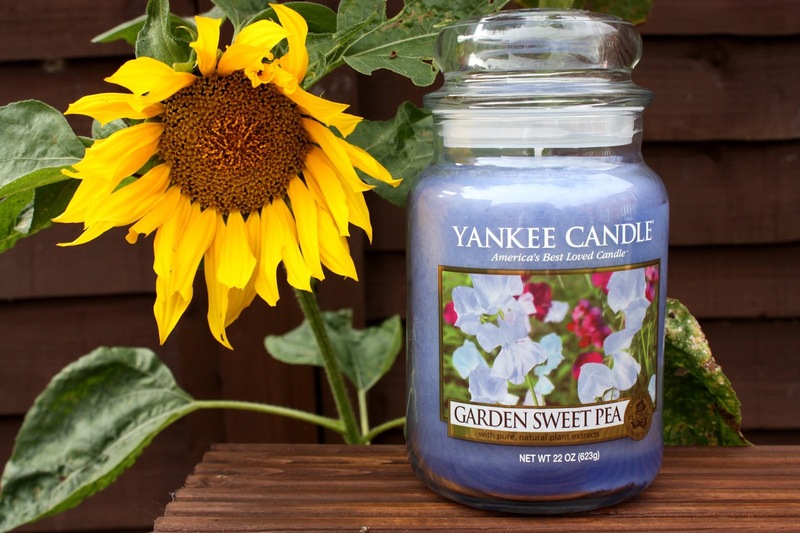 The description reads “the sweet perfume of delicate blooms accented with hints of pear, peach, freesia and rosewood.” It’s a really subtle, flowery smell so not too overwhelming at all and it’s perfect for making your house smell like spring all year round! Now these were a total bargain. When I showed these to Matt’s mum she was so surprised at the price and I think she may end up heading there herself! 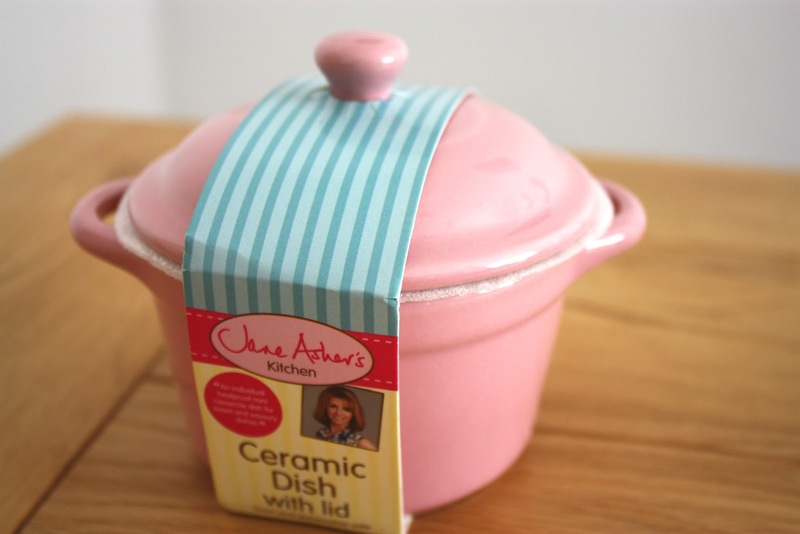 I’ve known for a while now Jane Asher has a range in Poundland (that’s right, Poundland!) and for someone like me, it’s a total dream. Full of pastel shades, mint green, lemon yellow and as you can see from my photo, the most gorgeous baby blue and pink. 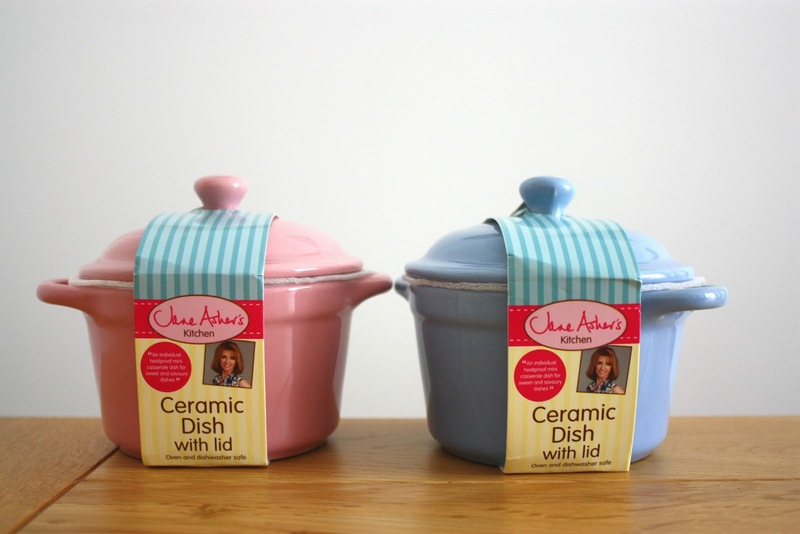 I couldn’t not get these little lidded dishes which are great for individual portions of food, whether that be for dinner or dessert. You could even just use these dishes to hold nibbles in. In my house, we currently keep medical bits and bobs in an old cracker box and I can’t say I ever went about looking for a specific container for my new home. But then I stumbled upon this and I just couldn’t resist! I love the brand, The Bright Side and have got a few other bits from there already. 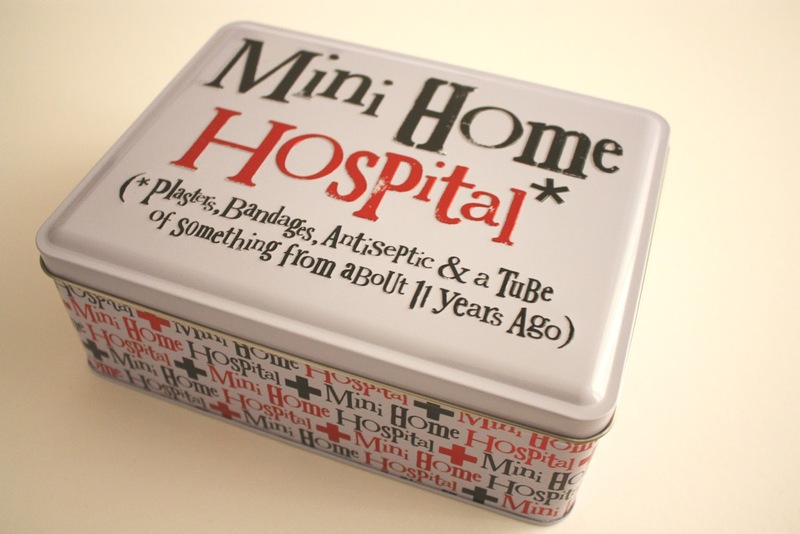 It’s a good size too for all your medical needs and already holds paracetamol, plasters and antiseptic wipes (thanks Mum!). This will definitely be taking pride of place in one of our kitchen cupboards! I have always loved long, leisurely breakfasts at the weekend, where nobody is in any rush to leave the table and there are huge helpings of bacon, eggs and sausages, jugs of juice and mountains of toast. Realistically, I know this is a rare thing but I still wanted little bits and pieces for when we have guests or allow ourselves to take a lazy brunch. I’d been keeping my eye out for a toast rack for ages and this one from Asda was just perfect. 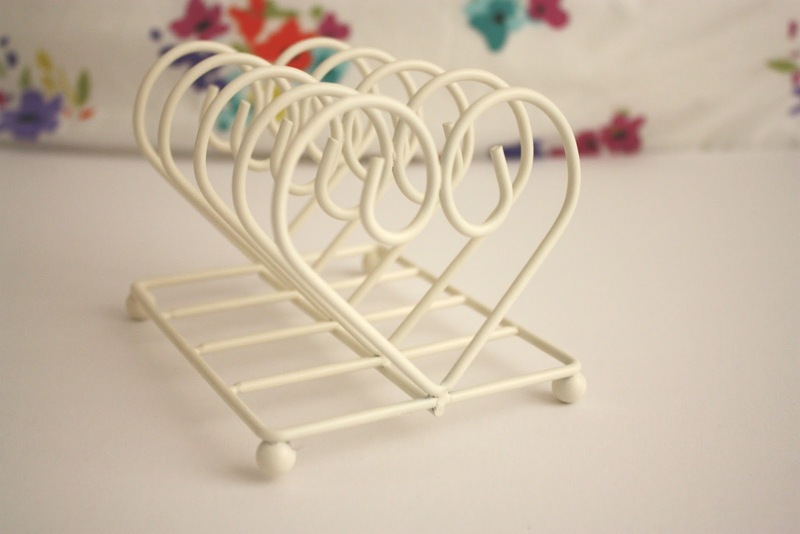 It was always going to have to be white, but the heart dividers really make this toast rack extra sweet. Our toaster also has four slots, so no need to wait long to be able to eat together either! Cath Kidston has long been a brand I’ve adored and I always knew that my house would feature a few pieces from the collection. Ever a bargain hunter, I was in the Cath Kidston factory store in St Neots (where every item is reduced!) having a browse yesterday. I like to tell myself (pretend) that I’ll be more inclined to do something if it is aesthetically pleasing to me and that was the case with these two purchases. I like to bake a lot and I’m also very messy with it so an apron just needed to happen at some point. Even better was that it came in a dotty pattern, a bit of a reoccurring theme in my wardrobe, so why break the habit of a lifetime? 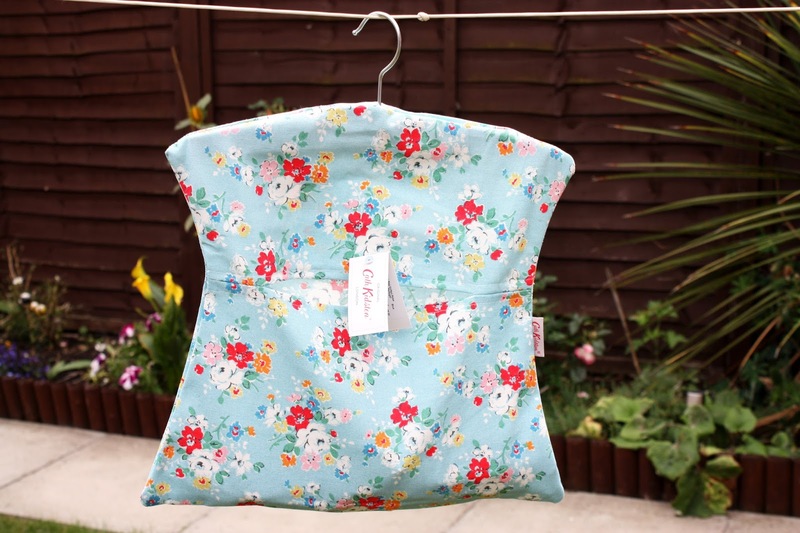 Next into my basket was this gorgeous floral peg bag which I love, I’m just hoping it will encourage me to hang up our washing! I’m so pleased with all the bits I’ve picked up lately, what homeware items have you been buying?